Botanical perfumer Alexandra Balahoutis was inspired to create a new limited edition perfume for her Strange Invisible Perfumes line by a song. And that song is: "The Rose With The Broken Neck" by Jack White and Danger Mouse*. I've found that many of my favorite beauty products, product colors and fragrances often have names with make you wonder, smile, frown...or raise an eyebrow, but you always remember them. This is one of those for me. But what is most striking about this scent is not the name nor the inspiration behind it. It's how beautiful a rose scent this is. If you're already a big rose fragrance fan - then this is the treat you need in your life. But this works even if you're not specifically a rose fan. 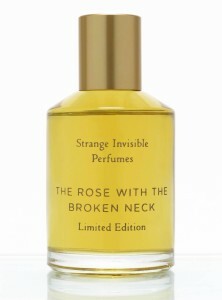 The Rose With The Broken Neck is a very unique scent which has an intricate yet sensual development which makes it one that stayed with me. The opening of the scent is a rose for certain - but one paired with a slightly sharp cognac note along with a bit of citrus from the Vetiver. As these two notes warmed up on my skin, the beautiful vanilla and spice came through, while still not overtaking the rose in any way. It remained warm, but still fairly light so it was never overbearing during the day. The dry down brought more of those cognac notes in and a slightly more pronounced rose, which was just so pleasant to have surrounding me. I would say I got about 6 hours of wear before having to touch it up a bit, and it's a scent that tends to stay fairly close to the body, so it's doesn't announce itself in the room before you. This product was provided courtesy of Strange Invisible Perfumes PR for reviewing purposes.